Of the 60% of Americans who have subprime or lower credit, many likely fear that they will never qualify for a loan or financing. The good news? Bad credit loans can be available if you know where to look. If you need to borrow, there are resources at your disposal even if your credit is less than stellar. Need some advice on where to look for a personal loan when you have bad credit? Read on for our top suggestions. As a homeowner, your house is likely the most valuable possession you can borrow against. Equity is a guaranteed source of collateral, which gives you a bit of wiggle room if your credit isn’t the best. The great thing about home equity loans is that they often have lower interest than your other personal loan options. If you’re looking to consolidate other forms of debt, a home equity loan can greatly reduce the amount of interest you’re earning. Even if your home isn’t paid off, you can still take out an equity loan. The equity available to you would be the value of your home, minus the amount you still owe on it. Typically you can borrow up to 80% of your home’s equity. Being a member of a credit union can have big advantages. Unlike traditional banks, credit unions are not-for-profit and are run by their members. Because of this, fees and rates at credit unions are often much lower, since they don’t have a bottom line to protect. Credit unions tend to look at your entire finances, rather than your credit score alone. If you are financially stable but have underwhelming credit, your membership at a credit union could be your ticket to loan approval. If you have possessions to borrow against and need some fast cash, a pawn shop can be a great resource. Your credit doesn’t matter at a pawn shop, as you’re borrowing against an item you already own. The interest rates at pawn shops can vary significantly. Their fee, in some states, can be anywhere from 15% to 200%. It’s best to check your local pawn shops ahead of time and see if their fee is a reasonable one, but you’ll find their interest is still less than payday lenders. Pawn shop loans are good for 1-4 months at most. You won’t receive the entire value of your item as a loan, but it could be enough to get you some emergency funds should they be needed. The shop lending you money will provide you with a receipt that includes the loan repayment date. Should you miss this deadline, the shop will keep your property and resell it to recoup their loss. Online lending is quickly growing in popularity for those with bad credit. Private investors take a risk on those looking to borrow, knowing they can see significant gains thanks to high interest rates. 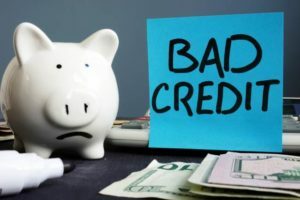 Those with bad credit can see interest rates as high as 37% on their online loans, depending on if said loans are secured or unsecured. Reasonable rates are available, however, especially if your loan has collateral. Online lending is a quick process, where you can apply online and get an approval fast. Depending on the lender you choose, however, you rates could be hard to afford. Shopping around for the best rates is easy to do online. Bad Credit Loans? It’s Possible! Though you may face more hurdles than someone with good credit, bad credit loans are available! Using these resources, you can get yourself on track to better credit and more borrowing power in the future. Want to apply for a loan today? Visit our lenders at Bonsai Finance. We specialize in loans and lines of credit, and have many personal loan options to get you the money you need.